How much do you remember from stories of the past week? 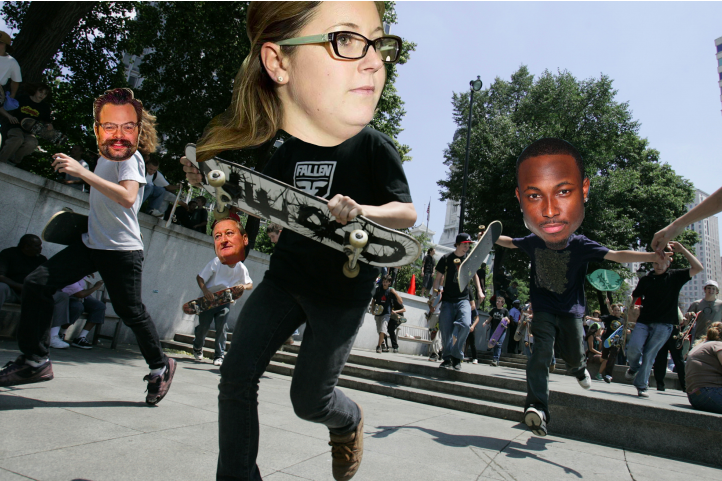 Answers to this week's PhillyVoice Quotes Quiz can be found in this photoshopped image of the 2005 National Skateboarding Day in LOVE Park. The answers are tucked at the bottom of each post (with the context available via hyperlink). We will know – and tell everybody – if you scrolled down and illicitly claimed you went 13 for 13. Real talk. Gloria Allred, attorney; Louis Busico, Kathryn Knott defense attorney; Roxanne Covington, Philadelphia Common Pleas Court judge; Rita DeMaria, couples therapist, Council for Relationships; Chuck Formoso, sous chef, High Street on Market; Carrie Hammer, designer; Andrew Haught, #phillyhatecrime victim; Jim Kenney, mayor of Philadelphia; Kathryn Knott, convicted of simple assault; Bill Mauchly, ENIAC computer-museum supporter; LeSean McCoy, NFL running back; Tara Nurin, Forbes.com beverage writer; Tom Wolf, governor of Pennsylvania. 4. "Until those faces appeared on the news, no one responded – and did so only to save themselves from prosecution." 6. "A lot of people just think they're too old [to date], but falling in love is timeless." 9. "We want people to come from around the country – hopefully from around the world – to come back here for one more spin on their skateboards." 10. “Let me be very, very clear with each of you. We are going to have to stop playing games with our fiscal future."